The Video and Multimedia Production Contract is intended for use when you are providing video production services for a client (web video clips, TV commercials, DVD's, etc. ), either as a complete stand-alone project or for inclusion in a larger project. This agreement also includes specific protections for the client to prevent video from being leaked prematurely to the public for sensitive material. I had this when I was consulting for clients! It would have saved me a lot time." This Video and Multimedia Production Contract is included in editable Word format that can be customized in Word or by using the included Wizard software. THIS AGREEMENT is made this Current Day day of Current Month, Current Year by and between Company Name ("Producers") and Company Name ("Customer"). Description of the Project ("Specifications"). Producers agree to develop the Project according to the terms listed on Exhibit B attached hereto. Materials provided to Producers for use in fulfilling the Project ("the Materials") may include, but are not limited to: Pictures, Film, Slides, 8-mm and 16-mm Film, Videotapes, Audio, Artwork, Motion Graphics, 3D Animation, Digital Media or other source materials required for inclusion in the Project. Producers are not responsible for lost or damaged materials and any compensation due Customer shall extend only to the cost of replacing the Materials in their raw or stock format. Services provided to Customer under this Agreement may include the use of sub-contractors and third-party services. Customer agrees to indemnify and hold Producers harmless from any and all claims for any loss, damage or delay to the Materials or Project while in transit or in the possession of third-party services or sub-contractors and agrees that damages shall be limited to replacement or replacement cost of the raw original material and media provided to Producers. Producers will use all reasonable efforts in the development of the Project and endeavor to complete and deliver to Customer the completed Project no later than Delivery Date by an approved party, provided that payment and all requested materials and instructions have been received by Producers from Customer. Any delay in the completion of the Project due to actions or negligence of Customer, transportation delays, illness, or circumstances outside the control of Producers shall alter the delivery date. Producers will make reasonable effort to notify Customer of any delays to the estimated delivery date as soon as possible. Proofs will be presented for Customer approval at each stage of development. If revisions are required, a request must be made when proofs are returned to Producers. Reasonable edits based upon Customer's feedback will constitute acceptable delivery unless otherwise agreed upon in writing by both Producers and Customer. The total number of proofs provided to Customer shall number Insert Number of Proofs Count unless otherwise determined in the Specifications. Proofs may be provided to Customer in formats that differ from the final output as outlined in the Specifications. Customer acknowledges that colors, printing, quality, media type or any other element presented in the proof to Customer may change upon final delivery and shall not constitute a breach or material deviation from the Specifications. Any requested changes to the Specifications shall constitute additional editing and incur additional charges or fees. Additional charges for editing and changes shall be billed at Hourly Rate per hour. All additional changes must be submitted and approved by both parties in writing by approved Contract Change form. Producers shall not be responsible for maintaining any copies of Project source files, masters, materials or other media created by Producers for Customer under this Agreement after any such materials have been turned over to Customer. It is Customer's sole responsibility to create back-up copies of any Project files received in order to preserve the integrity of their Project files and protect against unforeseen loss. Upon successful completion of all compensation terms and outstanding balances owed to Producers,. Customer is granted full and unlimited reproduction rights to the Project. Customer is granted a one-time, limited use reproduction right for the Project in exchange for the compensation paid to Producers. Project shall not be reproduced in any format without the written consent of Producers. Producers retains the right to reproduce the Project in any form for marketing, future publications, competitions or other promotional uses. Producers shall at no time reproduce the Project for use in commercial means or for-profit use. Except for Customer's Proprietary Material contained in the Project, Producers shall hold all right, title, and interest in all original artwork, whether in draft, mock-up, concept or final development for the Project. Customer hires Producers to make a videotape, CD-ROM, DVD, or audio transfer, for commercial use. All edited video, CD-ROMs, audio and DVD will be subject to copyright by Producers. Any unauthorized copying is strictly prohibited. All equipment, supplies, cameras, edited or master media or any original media produced during the execution of this Agreement shall remain the exclusive property of Producers. In return for the Projects that are completed and delivered under this Agreement and Exhibit B, Customer shall compensate Producers, pursuant to the terms of Exhibit A attached hereto. In the event Customer fails to make any of the payments referenced in Exhibit A by the deadline set forth in Exhibit A, Producers have the right, but are not obligated, to pursue any or all of the following remedies: (1) terminate the Agreement, (2) withhold all files, artwork, source, commitments or any other service to be performed by Producers for Customer, (3) bring legal action. Customer is responsible for all third-party material costs as outlined in Exhibit A, and accepts responsibility for all additional approved costs that Producers may incur in the development of this Project. All masters, film, tapes or other source materials shall remain the exclusive property of Producers and will only be made available to Customer for an additional fee. Customer and Producers acknowledge and agree that the Specifications and all other documents and information related to the development of the Project, excluding however, Customer's Proprietary Material, (the "Confidential Information") will constitute valuable trade secrets of Producers. Customer shall keep the Confidential Information in confidence and shall not, at any time during or after the term of this Agreement, without Producers' prior written consent, disclose or otherwise make available to anyone, either directly or indirectly, all or any part of the Confidential Information at any time. Producers will not make any of the Project materials, whether in part or in whole available to the public domain or any third-party not authorized by Customer prior to obtaining a written release from Customer or verification that the Project materials have been made available to the public by the Customer. Note - For time-sensitive materials or releases, both parties are encouraged to put a schedule of this information in Exhibit B, the Specifications. Producers warrant the Project will conform to the Specifications. If the Project does not conform to the Specifications, Producers shall be responsible for the timely correction of the Project, at Producers' sole expense and without charge to Customer in order to bring the Project into conformance with the Specifications. This warranty shall be the exclusive warranty available to Customer. Customer waives any other warranty, express or implied. Customer acknowledges that Producers is not responsible for the results obtained by Customer's use of any part of the Project. Customer acknowledges that Producers are not responsible for fixing problems on the Project, once mass-produced or after Customer has tested, proofed and approved the Project ("Sign off") in writing. Except as otherwise expressly stated herein, Customer waives any claim for damages, direct or indirect, and agrees that its sole and exclusive remedy for damages (either in contract or tort) is the return of the consideration paid to Producers as set forth in Exhibit A attached hereto. All Master Tape(s) or other source material created for the Project shall be stored at Producers facilities for 1 year from the date of this Agreement. Producers reserve the exclusive right to destroy, delete or otherwise dispose of any materials, whether Customer provided or not that are still in Producers possession after 1 year from the date of this Agreement. Original materials provided to Producers by Customer shall be returned upon successful completion of the Project or to the last known good address for Customer. Producers will be retained as independent contractors for the length of this Agreement. Producers will be fully responsible for payment of their own income taxes on all compensation earned under this Agreement. Customer will not withhold or pay any income tax, social security tax, or any other payroll taxes on Producers' behalf. Producers understand that they will not be entitled to any fringe benefits that Customer provides for its employees generally or to any statutory employment benefits, including without limitation worker's compensation or unemployment insurance. Customer agrees to make available to Producers, for Producers' use in performing the services required by this Agreement, such graphical elements and materials as Customer and Producers may agree in writing for such purpose. Failure to provide Producers with Materials in the requested formats may result in additional delays or fees in addition to those stated in Exhibit A. This Agreement shall be binding upon and enure to the benefit of Customer and Producers and their respective successors and assigns, provided that Producers shall not assign any of their obligations under this Agreement without Customer's prior written consent. Customer has no right to assign, sell, modify or otherwise alter the Project, except upon the express written advance approval of Producers, unless otherwise noted in Section 3. In the event Customer fails to make any of the payments set forth on Exhibit A within the time prescribed in Exhibit A, Producers have the right to immediately cease all work on the Project until payment in full is paid. Customer warrants that everything it gives Producers to put on the Project is legally owned or licensed to Customer. Customer agrees to indemnify and hold Producers harmless from any and all claims brought by any third-party relating to any aspect of the Project, including, but without limitation, any and all demands, liabilities, losses, costs and claims including attorney's fees arising out of injury caused by Customer's products/services, material supplied by Customer, copyright infringement, and defective products sold via the Project. Customer grants Producers the right to use the Project for promotional purposes and/or to cross-link it with other marketing venues developed by Producers, unless otherwise restricted in the Specifications. Subject to Section 4 above, Producers have the exclusive rights in making any derivative similar works of the Project and any similarities between Customer's project and future projects constitutes Producers' methods and style and shall remain the right of Producers. 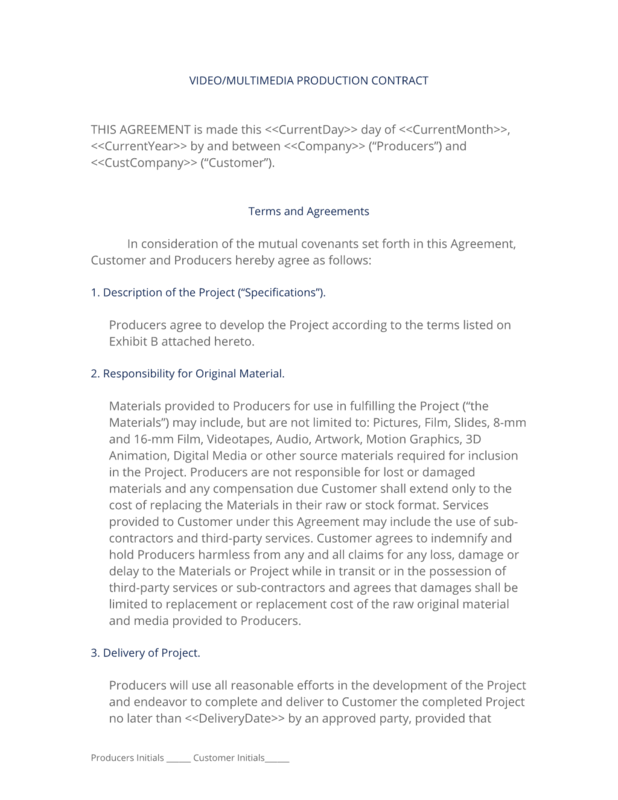 The complete Video and Multimedia Production Contract - with the actual formatting and layout - is available in this Contract Pack.